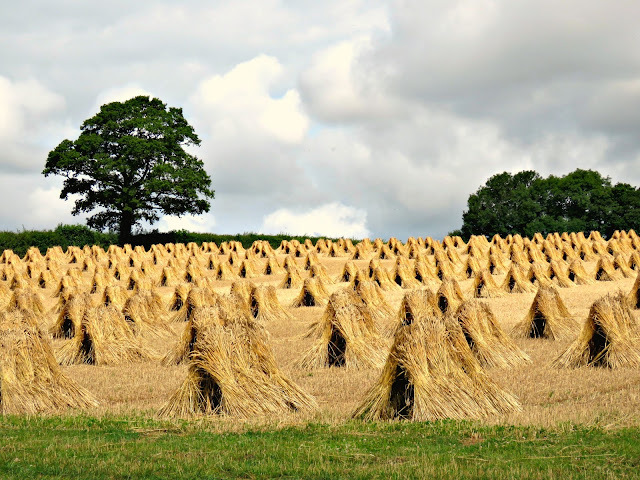 Yesterday whilst we were out on our travels we were delighted to come upon this field of straw stooks. Whilst I'm not much of an expert on traditional thatching techniques I'm pretty sure that this is long straw, grown and harvested in the the time-honoured way, for thatching the local cottages to keep everyone weather-proof over the winter. It always makes me smile when I come across something like this: a country scene that hasn't changed in a millennium. I'm not saying that I'd have liked to live under William the Conqueror, but in a rapidly changing world it's sort of reassuring to know that some things stand still. And then I had a play to see whether I could turn the shot into something a little more atmospheric, fiddling with monochrome and sepia to make it feel like Michael Henchard, the Mayor of Casterbridge, might come marching out of the rows.